The Acer Aspire Switch 12 S is a testament to Acer's ability to produce a thin 2-in-1 laptop with elegant style and uniquely engineered features. 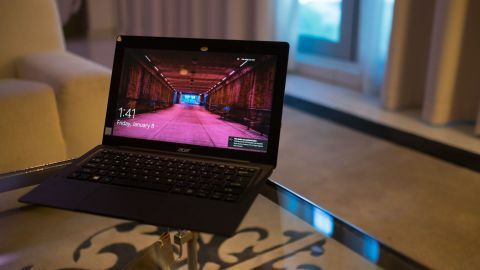 Acer has been at the 2-in-1 laptop game for a long time, and while its Switch series hasn't always impressed with some clunky and bulky systems, the Acer Switch 12 S is simply its best convertible notebook ever. The 12.5-inch laptop is Acer's thinnest hybrid yet, and packs a Core M processor and a 4K screen. Acer is positioning the Switch 12 S as a premium home and work machine, and its fully metal body certainly backs up that claim. The machine is elegant and thin, and the build quality is solid thoughout. The screen measures an impressive 0.31 inches (7.85mm) thin considering the processor, battery and other components tucked behind the display. In tablet form it doesn't weigh too much either at 1.76 pounds (0.8kg). With the equally thin, magnetic keyboard dock attached the Switch 12 weighs 3.09 pounds (1.4kg). Overall, you're looking at a pretty light device that weighs less than the 3.14lb (1.43kg) Asus Transformer Book T300 Chi, although more than the 2.62lb (1.18kg) Surface 3 with its keyboard cover. The 12.5-inch tablet-hybrid is still thicker than both Asus and Microsoft's competing devices. Still, the Switch 12 S is considerably thinner than Acer's other convertibles, largely thanks to a latch-less, magnetic connector that keeps the keyboard firmly adhered to the tablet section. Not only is the system less complicated, Acer has also done away with any bothersome contact pins, and built gold power and data connectors directly into the two prongs that hold onto the screen. Acer calls this new element its snap hinge, and it makes it possible for the device to send 6Gbps data streams between the keyboard and tablet. While the screen portion is limited to smaller USB-C and other micro-sized ports, the keyboard features fold-down, full-sized USB 3.0 ports. It's a smart use of space, and a design element I haven't seen in any other device. Unfortunately, the keyboard dock does not feature a full-sized SD card reader on top of its two USB ports, and it needs to draw power from the tablet. However, the keyboard itself is excellent, with deep key travel and a decently sized trackpad. The IPS display Acer has implemented is impressive in its own right. For my hands-on I got to feast my eyes on the 4K (3,840 x 2,160) model, and it's gorgeous. Colors pop off the screen, and Acer has also made the display in such a way that there's no air gap between the pixels on the display and the cover glass on the touchscreen. If you're looking for better battery life, there will also be models sporting a 1,920 x 1,080 display, which will still be sharp enough for a 12.5-inch device. As with other Windows 10 hybrid devices, the Switch 12 seamlessly swaps between tablet and laptop modes. Additionally, you have a few extra orientation options, including tent and presentation modes. It's light enough to hold as a tablet around the house, and in laptop mode the snap hinge helps lift the keyboard slightly for a better typing angle. Available starting this February, the Acer Switch 12 S will launch with prices starting at $999 (about £688, AU$1,436). Other configuration options include 4GB or 8GB of memory, and 128GB or 256GB of SSD storage. The Switch 12 S is one of the finest hybrids Acer has ever produced, but it won't cost you an arm and a leg to buy it. There are plenty of new features to admire, along with the premium feel of the device and its vibrant 4K display. While Acer's latest convertible is ambitious, and impresses based on my short time with it, I'll have to take an extended look at the device before I can confidently recommend it.